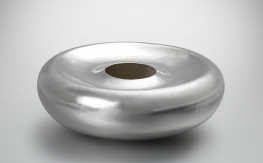 “A dynamic and revelatory exhibition by 12 leading contemporary British silversmiths... Twelve stunning, yet contrasting silver vessels form the core of the exhibition, each made by a different leading British silversmith. 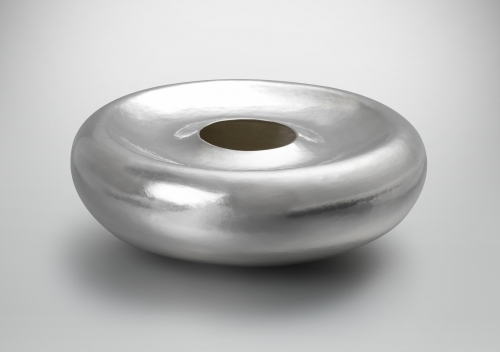 The participating silversmiths namely Vladimir Böhm, David Clarke, Rebecca de Quin, Sarah Denny, Alistair McCallum, Grant McCaig, Hector Miller, Peter Musson, Theresa Nguyen, Michael Rowe, Toby Russell and Lucian Taylor were chosen as they embody differing philosophies and approaches to their craft and demonstrate interesting, diverse making processes". Description : For this brief in particular, I really liked the idea of simply and clearly showing the movement of a beautiful curve within a piece, by creating a large raising from a single sheet of silver. Expressing movement – energy – lack of energy – these were all factors I began to consider. It was a long time before the project arose that something had sparked off a concept of ‘plunging’ form. I can’t specifically recall the exact thing I saw which got me thinking about it, neither did the thought stay long enough in my mind to put onto paper the line I must have thought of, so it washed over me and I set the loose idea aside. It wasn’t until something as silly as having a dried fig, lifeless and dry, in front of me which got me thinking of the overlooked idea once again. I wanted to recreate a ‘plunging’ form – simple changes of movement within an object, struggling to become a ‘perfect’ form. “In the beginning of life she grows outwards, wide upwards and with great confidence she reaches out curving her rounded outline delightfully. But her course changes - the strong energy is failing and her growth is weakened. She lowers downwards but eagerly attempts to move inwards, reaching across a wide round surface to her exposed centre in order to close her form. Determination and great strenuous effort is taken over time, to finally fulfil a closed body.” The object is a representation of effort and willpower to create a conventional ‘perfection’. Though she may feel failure, something far more beautiful and distinguished has evolved - although she herself is oblivious. Age and texture was something I strongly had in mind and so research work developed around snaps I’d taken of various dried figs as well as opposing textures of mushrooms and dried onion layers - or rather shells. Contours of home grown marrows and courgettes were something I pondered over to represent this ‘plunging’ movement of form. I always try to have in mind that ‘less is more’, and that keeping objects tidy, sophisticated and as best made as possible are the most important factors to hold onto, therefore texture and contours were eventually put aside so as not to encroach on the final shaping.